I've been good lately so I rewarded myself with a SMS lattice bent billiard meerschaum. I've been wanting one for a good while and the price was right at Frenchy's on this used one. Steverino wrote: Just picked up another Kaywoodie Signet dublin, one of my favorite shapes. OOoo, pictures!!! Let's see the old ebay page before it's taken down! I love me some Grabow. Thanks, it was a nice find, the shop owner was letting me rummage through a bunch of old drawers full of pipes and I found that one and he was suprised he still had it, said it was about 10 years old, and they don't make them with the buffalo shank anymore, said if I didn't buy it he would probably up the price and put it on display, so I was happy to get the deal I got on it. It has pretty much taken up the mantle of my new favorite pipe! I think I'll designate it as my Thursday pipe so you can see me smoking it each week. It's a no name knock off of Gandalf's pipe but i really like how the entire shank is made of some sort of wood instead of Vulcanite. (sorry the img is poor quality, i took it with my phone). Got and estate basket. Four stingers a twin bore and a small Bavarian three piece and what appears to be a 70-80 GBD, hardly smoked. The wife loves the Bavarian for decoration so I reckon mine is half price. My latest pipe purchase was a Butz-Choquin Private Lable Half & Half from the Virtual Smoking Lounge. Great pipe...good draw. 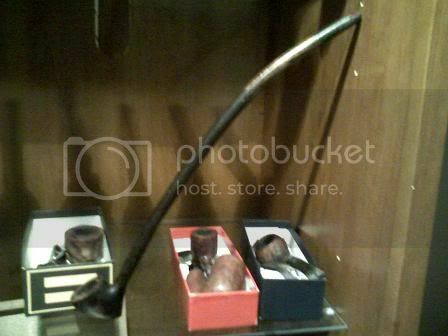 liquidavalon wrote: My latest pipe purchase was a Butz-Choquin Private Lable Half & Half from the Virtual Smoking Lounge. Great pipe...good draw. Welcome to our virtual sanctuary. Last edited by Hitchh on Tue Mar 24, 2009 2:07 pm, edited 1 time in total. Fantastic pipe I wish I had seen it first. Comgratulations on a most exellent pipe purchase . Picked up my first Kaw Valley this week, was so impressed I ordered one for my Father. Thanks Fred for the great pipe and excellent service! Nice Pipe Jim!! Hope is smokes as good as it looks! Last edited by Hitchh on Sun Mar 29, 2009 9:22 am, edited 1 time in total.